Aiming for a map-based system, but meantime it will be a list. * no specific route notes for the route we followed in these countries. If you want more information, please comment on this page and I’ll add what I can. I have been enjoying your blog on here and also on “crazy guy” and am setting off to do an Alaska to Argentina cycle trip this year and your route details and gear tips have been brilliant. I wanted to thank you for the time you have put in to make them available to everyone. I am in Kalgoorlie at the moment, in WA, and am itching to leave to the frozen north in June, but off to the UK in April. I think I read somewhere that you hail from WA, if you are keen for a beer sometime it would be good to compare notes. Eg, would you fit huge tyres for the trip and forgo suspension? Hope you are both well and planning more trips for the future. Matt – we do indeed hail from WA – Fremantle to be exact. We’re warm showers hosts if you’re passing by by bicycle and we’d be very happy to chat through our thoughts on kit in retrospect – tyre size and suspension depend on what type of trip you’ve got planned. Let us know your movements? We did it, and returned last year. Thanks for your excellent blog and route information. It feels surreal to look back through your pages and think about what it was like before we were familiar with the landscapes and climate. We are now living in the UK and we are on warm showers too so if you are nearby, let us know! I will be leaving from Santa Fe along the GDMBR into Mexico later this year and your route is exactly what I had in mind for myself. 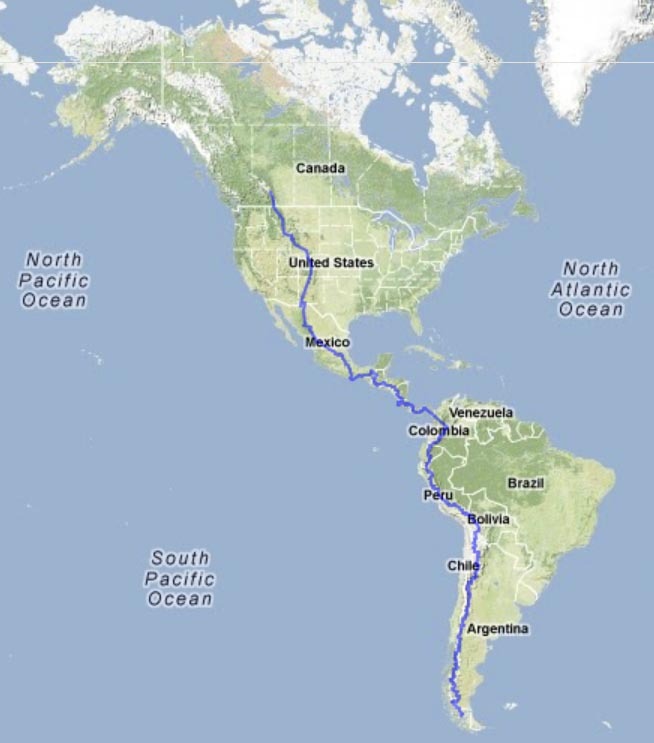 Something with a 60/40 mix of paved/dirt down the “spine” instead of the usual Pan American coastal route. I spent a lot of time camping from Prudhoe Bay to Santa Fe last year and I would like to take more of a credit card approach through Mexico. Light and fast appeals to me for this leg just to shake things up a bit. My question is how realistic it would be to rely primarily on hotels along the way through Mexico. I will carry a sleeping kit (tent, bag) for times when I feel like camping or have to but it will be a very light weight affair, just the basics and likely no cooking kit. Any insight you have regarding the availability of lodging in the smaller remote towns you passed through along your route would be greatly appreciated. You’d probably manage with the intent to stay in villages if you wanted. On our route it would entail a reasonable degree of functional spanish as we didn’t encounter many english speakers along the way. Food-wise, you should be able to manage without a stove if you’re going to be staying in lodgings. It’s not really our style – as we preferred to bush-camp and do pretty short stops in towns/villages for supplies. At that stage of our trip our spanish wasn’t really good enough to negotiate lodgings in the smaller places. Hope this helps and isn’t too late? Thank you very much for getting back to me. I too like to camp but I did it all the way through Alaska, Canada and then along the GDMBR and I just wanted something different for Mexico/Central America. A fast CC tour with a mix of dirt and pavement sounded fun for a change of pace. I will be returning to full-on loaded touring in South America however. Anyway, your comments about the language barrier have me second guessing myself but it’s good to know it may be doable from a logistics prospective as least.